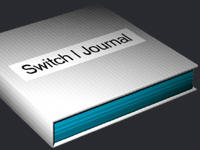 SWITCH is the new media art journal of the CADRE Laboratory for New Media of the School of Art and Design at San Jose State University. It has been published on the Web since 1995. We are interested in fostering a critical viewpoint on issues and developments in the multiple crossovers between art and technology. Our main focus in on questioning and analyzing as well as reporting and discussing these new art forms as they develop, in hopes of encouraging dialogue and possible collaboration with others who are working and considering similar issues.